Although Spain is certainly more famous for its excellent Spanish wines, there are a number of cocktails that are made throughout the country and abroad which include Spanish wine as one of their ingredients. Sangría may be the most famous of these cocktails, but that doesn't mean that you shouldn't try out some of these great Spanish drinks. Tinto de Verano is a popular Spanish wine cocktail which is similar to Sangría, albeit a lot simpler in terms of its ingredients. The drink is usually drank in the hot summer months, a clue to which is in the name - those of you who have ever been to Spain will know 'verano' means 'summer' in the Spanish language. Tinto de Verano is an easy drink to make at home as it is only made from red wine (normally an inexpensive variety) and gaseosa which is like lemonade. If you ever visit Spain, you will also see that this Spanish cocktail is readily available in bottled form in the Spanish supermarkets - the most famous brand is La Casera. 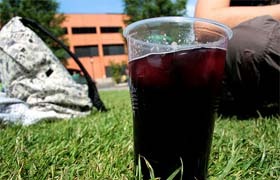 In comparison with Sangría, Tinto de Verano is a much more common drink and is therefore a lot cheaper. It is also much more common to see this drink at parties, festivals and bars. Sangría is considered to be a 'higher quality' drink but is also associated with tourists - which often means that it carries a higher price. To make this cocktail, all you need is red wine and a lemon flavoured, carbonated drink mixed at a quantity of half wine, half lemonade. The wine is usually a Tempranillo wine but does not have to be expensive or a good quality. If you do not have Spanish gaseosa, then you can replace it with any lemonade. To serve the drink, you should pour the drink into a long tall glass which contains a lot of ice cubes. You can add a slice of lemon to top it off, but this is up to you. The Calimocho, or Kalimotxo, is another cocktail made with Spanish wine however this is not as upmarket as either tinto de verano or sangría. Calimocho is made from mixing cheap red wine with cola - a drink which is made throughout the world but is particularly popular in Spain. It is not clear as to how this drink got its name. 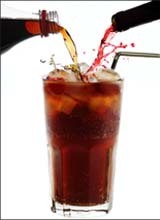 We know that in the early 1970s, it was often known as the Cuba Libre del pobre (Poor Man's Cuba Libre) in some areas. However the popular story of how the name came about comes from the Puerto Viejo festivals of 1972 in the Basque Country. Apparently, the drink servers at the festival realised that the wine they had purchased had gone bad, and so they decided to mix the drink with cola to get rid of the sour taste. The creators of the cocktail then decided to name it after their two friends, Kalimero and Motxo, which gave rise to the Basque name 'Kalimotxo'. Later on this name became popular throughout Spain, where it was later adapted to the Spanish spelling 'Calimocho'. In the Basque Country, they still use Kalimotxo. If you visit Barcelona or anywhere else in Catalonia, you might see the name 'calimotxo' although the Basque version is also used. Other varieties including shots of blackberry liqueur, kiwi liqueur, or vodka. As we mentioned earlier, this drink is also popular across the world. In Chile, they call it 'jote' which is the name of a bird found in the country. This bird has red and black plumage which symbolises the red wine and black coloured cola. It is due to this that the drink is also often called 'licor de ave' or 'bird liquor'.